URPLE Gallinules are found in the South Atlantic and Gulf States, and casually northward as far as Maine, New York, Wisconsin, and south throughout the West Indies, Mexico, Central America, and northern South America to Brazil. The bird pictured was caught in the streets of Galveston, Texas, and presented to Mr. F. M. Woodruff, of the Chicago Academy of Sciences. Gallinules live in marshy districts, and some of them might even be called water-fowls. They usually prefer sedgy lakes, large swampy morasses and brooks, or ponds and rivers well stocked with vegetation. They are not social in disposition, but show attachment to any locality of which they have taken possession, driving away other birds much larger and stronger than themselves. They are tenderly attached to their little ones and show great affection for each other. The nest is always built among, or near the water plants of which they are fond. It is about eight inches thick and fifteen to eighteen inches in diameter, and is placed from a foot to two feet out of water among the heavy rushes. The Purple Gallinule is known to build as many as five or six sham nests, a trait which is not confined to the Wren family. From four to twelve smooth shelled and spotted eggs are laid, and the nestlings when first hatched are clad in dark colored down. On leaving the nest they, accompanied by their parents, seek a more favorable situation until after the moulting season. Half fluttering and half running, they are able to make their way over a floating surface of water-plants. They also swim with facility, as they are aquatic, having swimming membranes on their feet, and while vegetable feeders to some extent, they dive for food. It is noted that some Gallinules, when young, crawl on bushes by wing claws. The voice somewhat resembles the cackling or clucking of a hen. It eats the tender shoots of young corn, grass, and various kinds of grain. When the breeding season approaches, the mated pairs generally resort to rice fields, concealing themselves among the reeds and rushes. Mr. Woodruff noted that when the railway trains pass through the over-flowed districts about Galveston, the birds fly up along the track in large multitudes. The Purple Gallinules are stoutly built birds, with a high and strong bill, and their remarkably long toes, which enable them to walk readily over the water plants, are frequently employed to hold the food, very much in the manner of a parrot, while eating. Why should thy beauty cause thee fear? His deadly tool of fire and lead? Thou holdest high thy stately head! To leave thee in thy sweet content.—C. C. M.
Purple Gallinules are one of the birds we see quite frequently here in central Florida. The article says that they “are not social in disposition,” but that is not after they have found those that feed them. We have only a few places were people feed the birds here; Lake Morton, Lake Hollingsworth, and Lake Morton that I have been to. 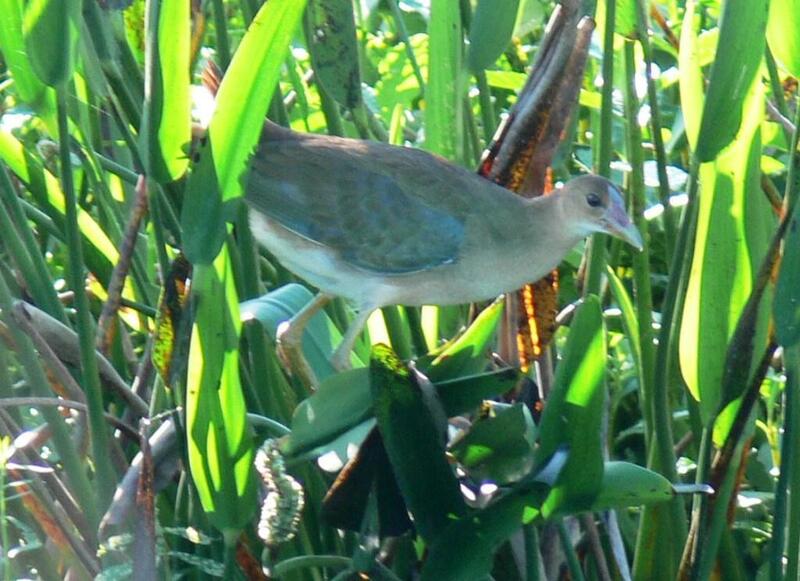 At all three of those places we have seen Purple Gallinules and many times they come running when the birds are fed. Yes, most times they hide in the vegetation and are hard to spot. They are actually a very pretty bird and they have such a nice purple sheen to them. I like their face with the blue plate and “candy corn” looking beak. Here is one I photographed at Lake Hollingsworth. You can see its big feet and how they like to walk along the vegetation. The Lord created them with feet like this so they can walk around on the vegetation and have their weight distributed better. That is a pretty typical behavior that we have observed. About the closest I have found to this being a Bird of the Bible is in verse 18 of Leviticus 11, which has the list of clean and unclean birds. 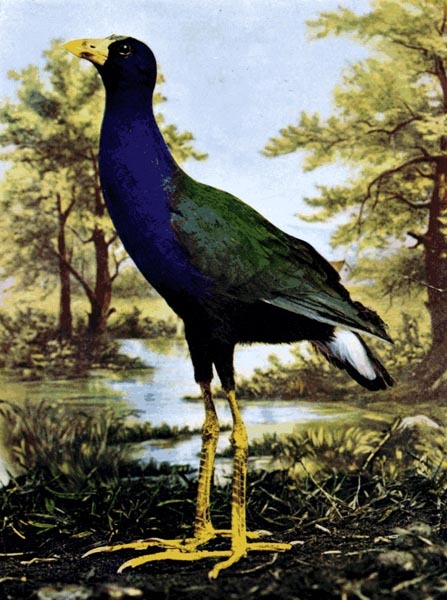 The “water-hen” is mentioned in several versions including the BBE, ERV, ISV, MSG, NRSV and the Bishops calls it the “red-bill.” The Common Moorhen is sometimes called the Water-hen and is in the same family as the Purple Gallinule. 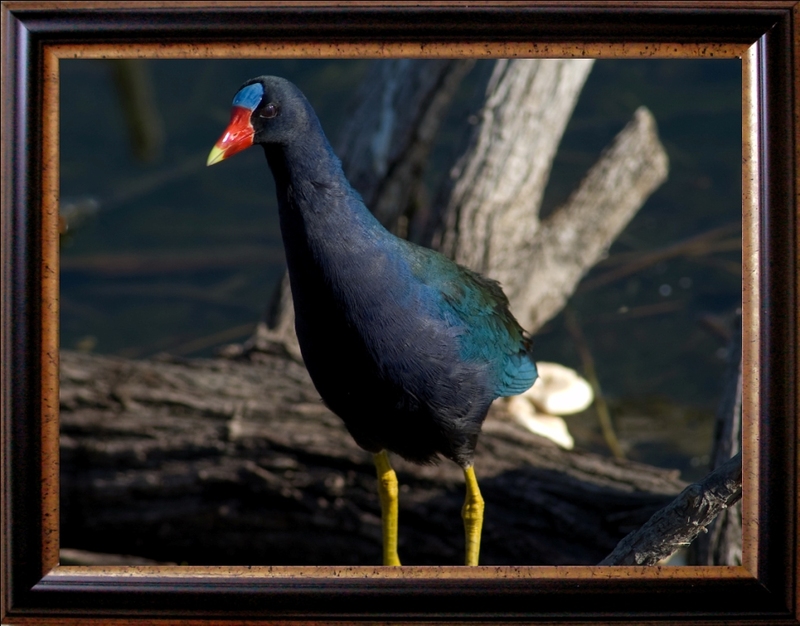 The American Purple Gallinule (Porphyrio martinica) is a “swamp hen” in the Rallidae – Rails, Crakes & Coots Family. This is a medium-sized rail, measuring 10–15 in (26–37 cm) in length, spanning 20–24 in (50–61 cm) across the wings and weighing 5.0–10.8 oz (141–305 g). Males are slightly larger than females. 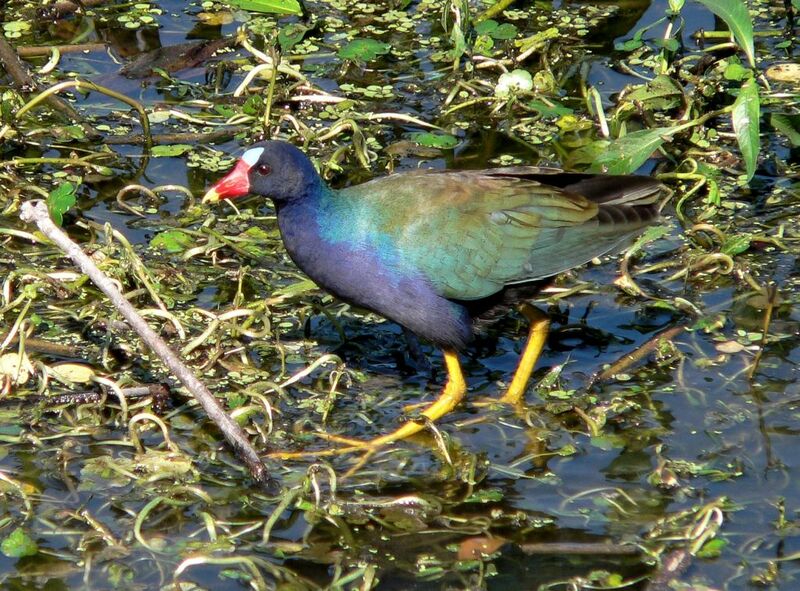 The adult Purple gallinule has big yellow feet, purple-blue plumage with a green back, and red and yellow bill. It has a pale blue forehead shield and white undertail. Darkness or low light can dim the bright purple-blue plumage of the adult to make them look dusky or brownish, although the forehead shield color differentiates them from similar species such as Common Moorhens. Their breeding habitat is warm swamps and marshes in southeastern states of the United States and the tropical regions of Central America, the Caribbean and northern South America. This species is resident in southern Florida and the tropics, but most American birds are migratory, wintering south to Argentina. The nest is a floating structure in a marsh. Five to ten eggs are laid. Their coloration is buff with brown spots. The diet of these rails is omnivorous, being known to include a wide variety of plant and animal matter, including seeds, leaves and fruits of both aquatic and terrestrial plants, as well as insects, frogs, snails, spiders, earthworms and fish. They have also been known to eat the eggs and young of other birds. 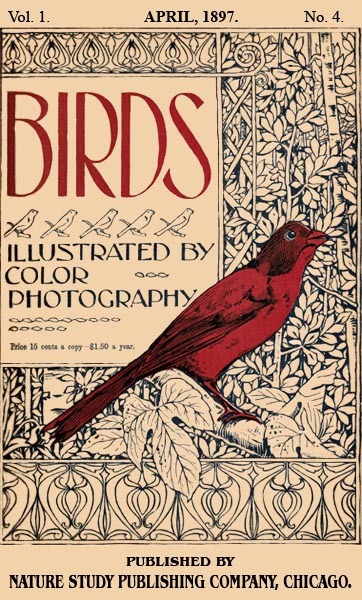 This entry was posted in Birds, Kid's Section and tagged Birds Illustrated by Color Photography, Birdwatching, Christian, From The Past, Gallinule, Home School, Kids, Photography, Rallidae, Vol 1 #4 April 1897, Youth. Bookmark the permalink.